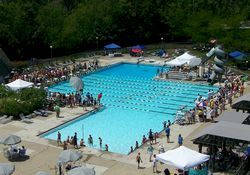 General Swimming Information - Muirfield Association, Inc.
Every resident over 2 years of age is required to have a Muirfield photo ID card. You must have a valid Muirfield Association Photo ID card to access the pool facilities, whether swimming or not. Previously issued non-photo ID cards are not accepted. If you have not had your photo taken and card issued, stop by the Muirfield Association office at 8372 Muirfield Drive between 8 am and 4 pm Monday through Friday. The ID card will be issued while you wait. Turnaround time is only 3 minutes! Cards are issued year-round. In most cases, if you have an adult Muirfield photo ID card already, you do not need to renew your card. A exception would be if you are a renter. Adults do not need to have new photos taken. Children's photos are discussed below. As children age, their photo will become outdated. A new card is not required yearly, but a new photo should be taken about every 4 years: age 6, 10, and 14. There is no cost for a replacement card providing the original ID card is surrendered. If the original card is not surrendered, there is a $10 per card replacement fee. An adult must accompany children under 18 to the Association office for a new photo to be taken. Previously, pool guest passes were mailed to residents with the annual meeting materials. For the convenience of our residents and to prevent problems with lost mail (and therefore lost passes), pool guest passes are no longer mailed. You may pick up guest passes at the Association office during regular business hours at any time of the year OR or at either pool during regular pool hours at any time in the season. Guest passes do not expire, so do not throw them out. Guest passes from any previous year may be used at the pools even if they have a specific year printed on them. Guests must always go to the pool with a resident (any resident). Additional guest passes may not be purchased; however, residents may still bring guests to the pool by paying at the gate. Cost is $2 per person, per visit, for any guest age 2 and up. Only members in good standing (no outstanding deed violations or delinquencies) may use the pools. Residents who are not in good standing may still pick up their guest passes, but will not be able to use the passes until they are in good standing. Summer storms can arise suddenly. When this happens, the pool manager will close the pool and clear the pool decks until at least 1/2 hour following the last clap of thunder and/or the last sighting of lightning. The pool will only re-open at the pool manager’s direction. Please respect the pool manager's decision regarding safety. 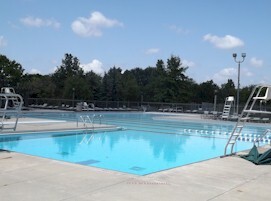 The Muirfins Swim Team uses the Glick Road pool for practices and swim meets. The Glick Road pool may be unavailable for residents' use after 3 p.m. on certain dates; however, the Holbrook pool will be open for your swimming enjoyment! The Muirfins schedule is located at the Glick Road kiosk or on the Muirfins website at www.muirfins.com. If a person has an "accident" in the pool which results in a pool closure, there will be a required reimbursement of $100 from the responsible party to cover the Association’s cost to properly treat and sanitize the pool and surrounding areas. Check diapers often! There are no enforced rest periods due to the Fair Housing Law that protects against discrimination based on age; however, the Association strongly encourages everyone to take advantage of a brief respite from the water. The short time-out gives a good opportunity to check swim diapers, re-apply sun screen, take restroom breaks and enjoy food from our concession stands. There is no specified time for lap swimming. If you wish to swim laps, ask a lifeguard to clear the lap lane for your use. If there are any issues, ask to speak to the pool manager. Each pool facility has a concession stand serving light refreshments. Patrons are also welcome to bring food and non-alcoholic beverages from home; however, they may not bring glass, alcoholic beverages, or breakable containers to the pools.